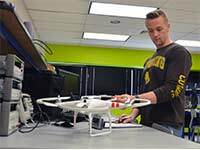 David Mohler inspects an unmanned aerial vehicle (UAV) used for research in the Department of Electrical and Computer Engineering. Unlike some college students, David Mohler, from Evanston, knows exactly what he will be doing when he graduates from the University of Wyoming. Mohler, a graduate student in electrical and computer engineering at UW, recently was accepted into the Science, Mathematics and Research for Transformation (SMART) Scholarship for Service Program. The scholarship allows the Department of Defense (DOD) to recruit and retain the next generation of science and technology leaders. Recipients work as summer interns during the academic degree program and subsequently are employed at a DOD organization following graduation. SMART funds the total cost of full-time tuition at UW and provides a yearly stipend. Mohler expects to graduate in spring 2019. The program was established by the DOD to support undergraduate and graduate students pursuing technical degrees in science, technology, engineering and mathematics (STEM) disciplines. Mohler started down the path two years ago, when UW engineering alumnus and College of Engineering and Applied Science Hall of Fame member Tom Lockhart visited campus. He was the director of the Air Force Research Laboratory’s Materials and Manufacturing Directorate and, during his visit, he and chief scientist Tim Bunning met with Mohler and other students. They talked with them about what it was like to work in research for the government in the aerospace and defense sector. Based on mutual interest, Lockhart offered Mohler an internship opportunity in Dayton, Ohio, at Wright-Patterson Air Force Base. During the internship, he interacted with the director and the chief scientist, both of whom encouraged him to pursue a graduate degree and told him he would be an excellent candidate for the SMART scholarship. They wrote letters of recommendation, along with his UW adviser Cameron Wright, who served in the Air Force. The award has a prestigious nature. In 2017, only 343 scholarships were given, and the award rate for reviewed applications was just 14 percent, according to statistics from the National Defense Education Program. As part of the selection process for the scholarship, candidates are interviewed by some of their prospective matches based on work and research interests. That means Mohler, who has several family members who have attended UW, will soon leave the high plains for the West Coast. He will likely always remember his experience at UW fondly.